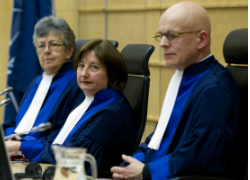 Why are War Crimes Sentences So Short? Earlier this summer, a US District Court issued sentences in a international maritime piracy case that involved four US victims. The defendant was not an actual pirate but a ransom negotiator for the piracy financiers. A Somali man who acted as a ransom negotiator for pirates who seized a yacht last year and killed four American hostages has been given 12 life sentences by a US federal judge. Mohammad Shibin was convicted in April on 15 charges including piracy, hostage taking, kidnapping and conspiracy. He was paid $30,000-$50,000 (£19,000-£32,000) in cash for his negotiating services, according to a federal indictment. It has always struck me as curious that the drafters of the Rome Statute would want to impose sentencing limits of judges in cases as serious as genocide and other mass atrocity cases. The cases at international tribunals often deal with much more egregious crimes – the Ituri region in Lubanga saw 60,000 persons killed. And yet tribunal judges have been unwilling to issue symbolic sentences that reflect the fact that mass atrocities are not ordinary crimes and should not involve ordinary sentences.